Preheat oven to 350°F. Line sheet pans with parchment paper or a silicone baking mat. With an electric mixer, beat butter with brown sugar and granulated sugar for several minutes until pale and creamy, scraping down the bowl at least once. Add eggs one a time, followed by the vanilla, mixing and scraping the bowl after each. Add the flour, baking soda, and salt and mix just until the dough just starts to come together. Add the crispy rice cereal and the chocolate chips and mix until combined. Portion dough into large 3 tablespoon rounds (this is the cookie scoop I use). Use a sharp knife or kitchen shears to cut marshmallows in half crosswise. Place a half into the center of each cookie dough portion. Use your hands to work the dough around the marshmallow so that the marshmallow is completely concealed inside. 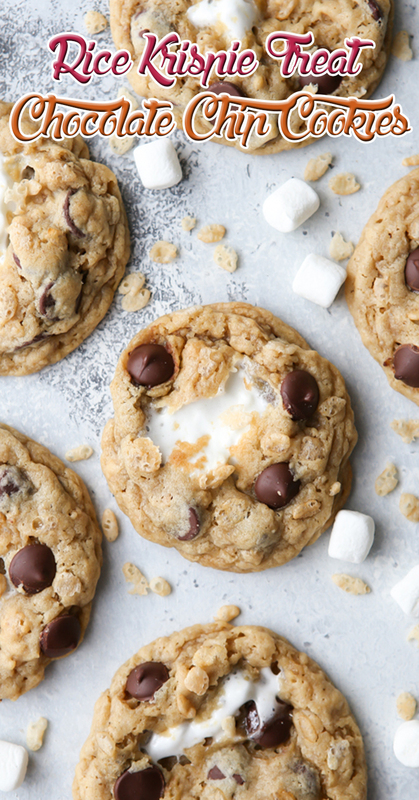 Bake for 8-10 minutes, just until cookies start to turn golden brown, but before the marshmallow melts completely. The marshmallow will puff out of the top of the cookie as it bakes and if you bake the cookies too long, it will melt and disappear completely. Let cookies cool on the sheet pan for 1-2 minutes, then transfer to a cooling rack to cool completely.